Wednesday, 2 July 2014: One Year and Ninety Three Days Old. It was the last day of our holiday today, traveling home tomorrow, and this morning we said goodbye to our friends, until next time. 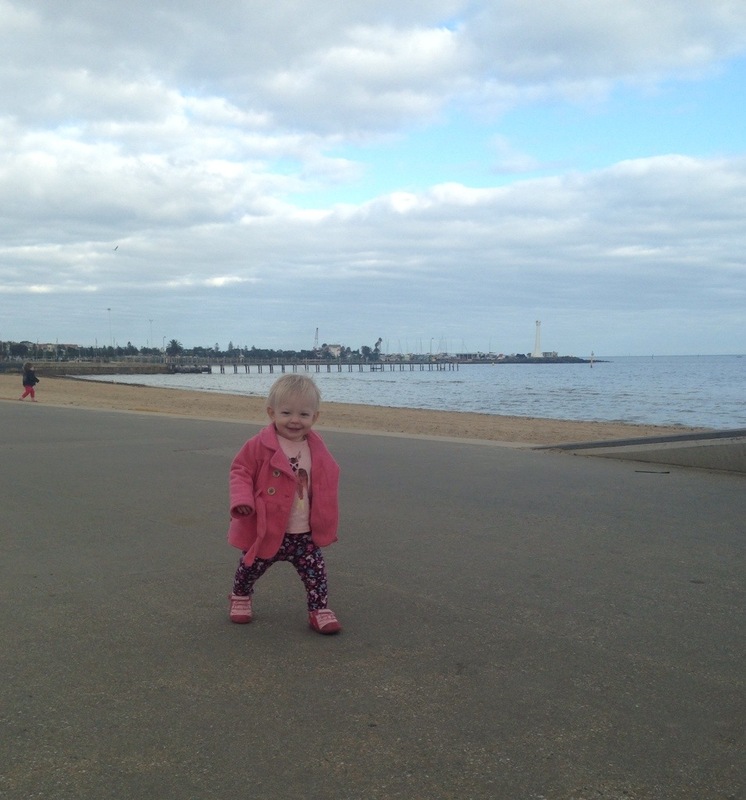 After they left to catch their plane Hubby, Ayla and I headed to St Kilda for the day. 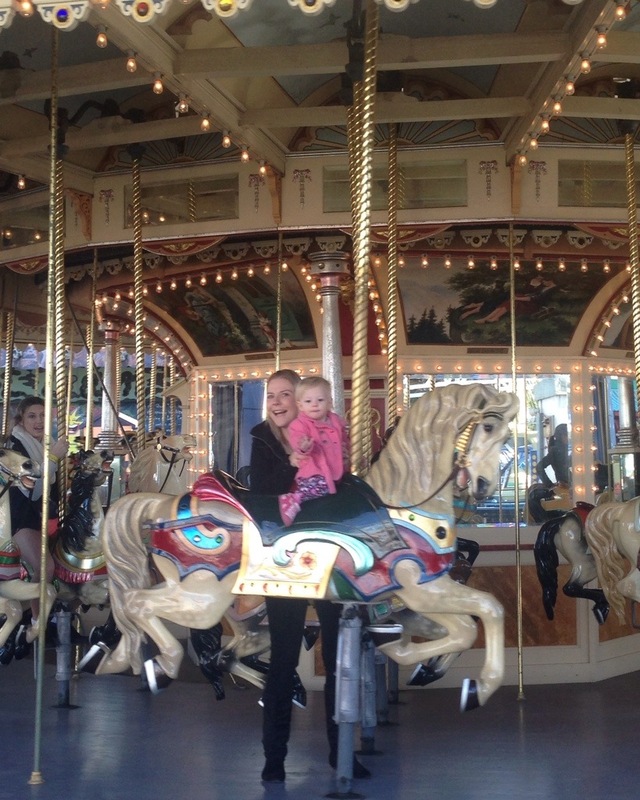 We started off at Luna Park where Ayla rode the carousel with me, the Binky Train with Daddy, AND she went on her first rollercoaster! Don’t worry though, it was a kids coaster where we say in little elephants that went around and up and down and it was great fun. After lunch and a cake on Ackland Street we went for a walk along the St Kilda foreshore where Ayla watched mesmerised as skateboarders practised tricks by the beach. We went back to the apartment for some last minute packing and a nap then caught a taxi to our hotel near the airport. We found a club nearby and went in for Dinner only to discover they had a kids disco on for the night! Ayla was in her element, running around and dancing with the other kids, kissing the one baby who was smaller than her, and chasing bubbles as they poured out of the bubble machine. Hubby and I were beside ourselves with love seeing our baby girl so happy and having so much fun, just like a big kid. It was adorable and a fantastic end to a great holiday!! Ayla can say “fish!” and she said it at least a hundred times today! We spent the morning at the Vic Markets, then headed to the Melbourne Aquarium for the afternoon. It was so adorable and my heart must have melted a thousand times over. 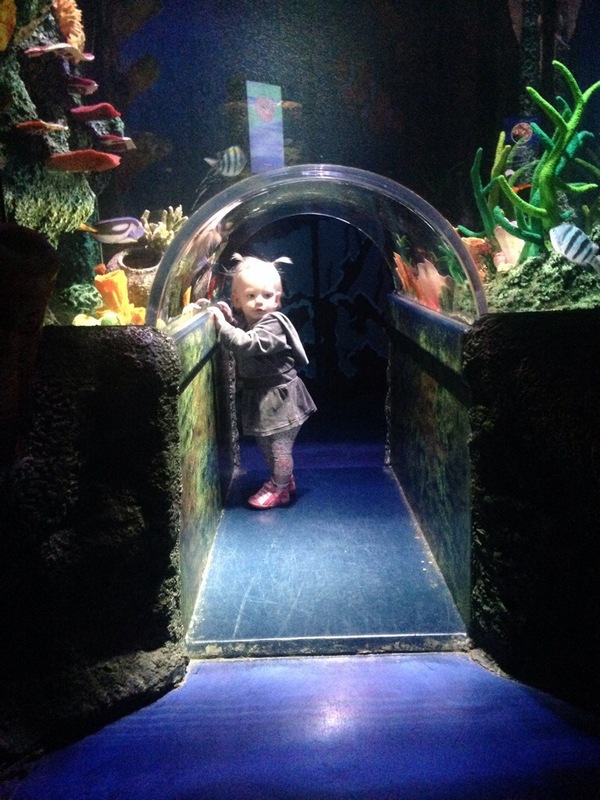 I think Ayla’s favourite was the coral reef section where there was a mini tunnel underneath one of the tanks that Ayla didn’t want to leave. She also loved the massive shark tank dome, and she ran from one end to the other and from one side to the other for ages. At the touch pool Ayla held a shark egg casing and a pearl shell and she touched a sea star. When we got to the estuary section we kept Ayla well away from the lifelike crocodile model… Just in case! 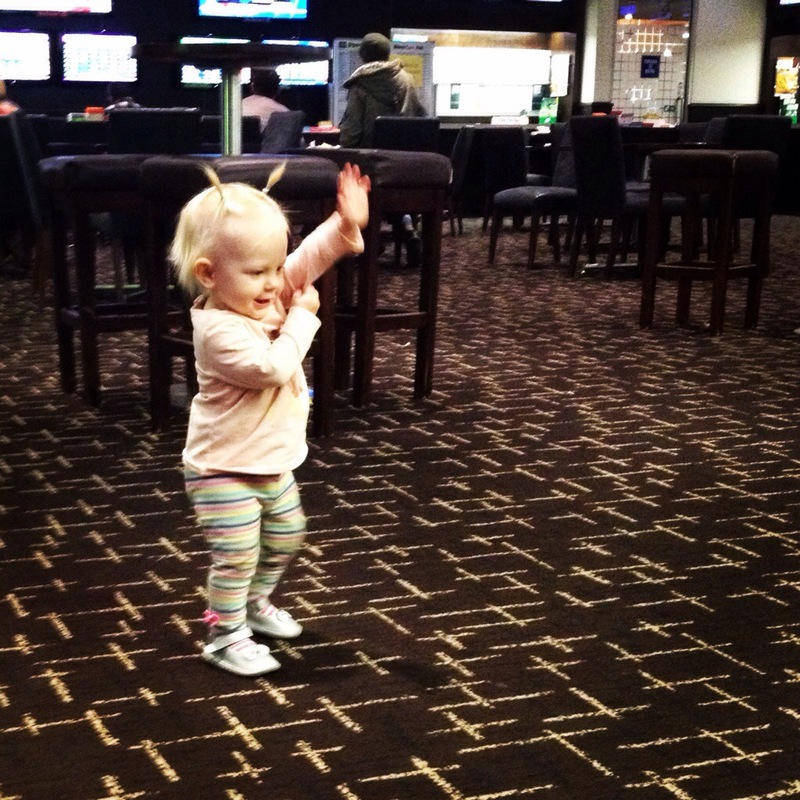 After the aquarium us girls went back to the room for a rest while the boys hit the Casino, Hubby coming home $200 richer! So it was our shout for tea and we found a fantastic Yum Cha in Chinatown that proved to be a great way to end an awesome day. Sunday, 29 June 2014: One Year and Ninety Days Old. 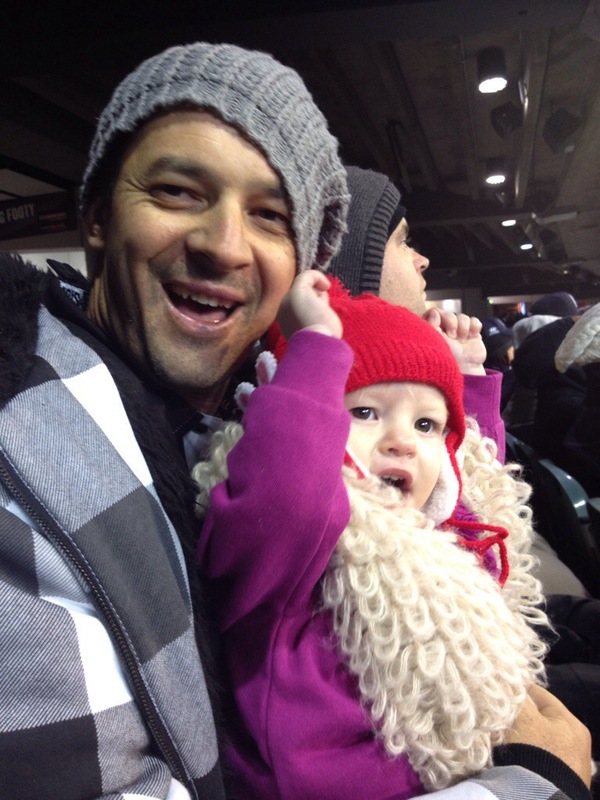 Ayla got to hear the barrackers a shouting tonight when we took her to see Collingwood v Carlton at the MCG! Hubby and I we’re so pumped to be back at The G and so excited to have our mini Magpie in tow. Ayla was fantastic, a little overwhelmed at first, but she settled in quickly and watched wide-eyed as the crowed cheered, putting her “go pies” move into action whenever she could. We had fantastic seats, in perfect view of the goals, but with not much shelter we felt the full force of the 6 degree air. Ayla was warm, in four tops and two pants, two pairs of socks, sneakers and a beanie, and when I produced a warm bottle of milk and wrapped us both up in a rain jacket she passed out for a whole quarter, without so much as a stir. The walk home was good, although freezing, but Ayla had the best seat in the house tucked up in the baby carrier on her Daddy’s chest, underneath his coat. Thursday, 26 June 2014: One Year and Eighty Seven Days Old. I was anxious about how Ayla would be on the plane today, even though it was her 11th flight in just 14 months of life!! My concern was unprecedented of course, Ayla was content and happy to sit with Hubby and I, eat snacks, have a couple of little snoozes and push buttons on the built-in screens. I thought that because Ayla’s walking now she might have wanted to explore the plane and make as many new friends as possible, but it turns out all her previous flying experience has taught her well. Ayla did have a little bit of ear pain on landing for the first time, and she went awfully quiet when we stepped outside into the cold Melbourne winter air but all in all we made it safe and sound. My great aunt was waiting for us at our hotel and took us out for tea with my uncle. It was their first time meeting Ayla and it was lovely to catch up and great to start the trip with a couple of friendly faces! Saturday, 7 June 2014: One Years and Sixty Seven Days Old. Ayla has never been more dirty in her life than what she was today… filthy. 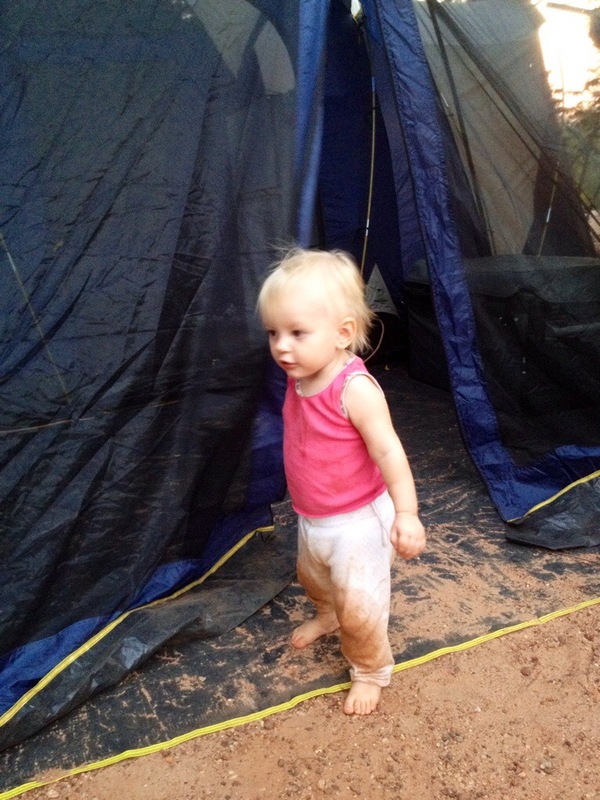 No photo would do it justice; Ayla had red dirt in her hair, mud smeared on her face, her arms were sticky with a combination of mozzie repellant and dust, her feet were black and her hands were sandy and her nappy had tiny stones in it. Mind you, the amount of fun Ayla had to get that dirty far outweighed the filth, and I loved seeing her enjoy the dirt as much as it enjoyed her! As soon as we put the tent up and Ayla down, Ayla started picking up handfuls of dirt and carrying it into the tent to throw it on the floor. After tiring of that game Ayla started drizzling dirt in her hair and along her arms, and she was completely unperturbed when her little friend Charlie and the girl from the campsite beside us decided to try and bury Ayla’s legs with tiny pebbles. Thankfully, Ayla was too busy learning about the feel and general uses for dirt that she didn’t eat any of it, intentionally at least. Monday, 5 May 2014: One Year and Thirty Five Days Old. Ayla definitely got the hang of the whole camping thing today, and I think it’s safe to say her childhood is going to be peppered with little getaways like this. Although Ayla’s nighttime sleeps have been a bit disrupted (understandably though – no one wants to be the first to leave the campfire) Ayla has been happy and playful and content all weekend. Then this morning Ayla showed us how comfortable she really is with camping when she passed out for nearly an hour on our swag while we packed up around her. Ayla was the picture of pure relaxation as she slept there in the shade, covered in dirt after a fun few hours and flaked out on her back like a sleeping starfish. After her snooze Ayla joined us for a final swim in the waterhole before deciding she could drive the truck. Ayla climbed from the passenger side (where I was trying to change her) to the drivers side, and pulled herself to standing at the wheel in the blink of an eye; Ayla even reached for the UHF radio and when I have it to her she talked into it straight away! Of course driving was not an option but while we were on the dirt tracks within the campgrounds Ayla claimed her place on my lap in the passenger seat. As Hubby drove, Ayla stood with her hands on the open window frame looking out at the world passing her by, smiling at the wind tickling her fluffy blonde hair, and looking like she’d been “playing truckies” her whole life. After a blissful stop at some hot springs on our homeward journey, where Ayla crawled and splashed and had me help her walk her around for ages, Ayla passed out in her chair within six minutes of leaving. Ayla was so tired and content though, that her head kept flopping forward in the most awkward of positions. No matter how many ways we tried to prop it up with towels, and no matter how many times we poked and prodded and pulled at her head, Ayla stayed asleep and continued to sleep more soundly than I’ve ever seen her before. Sunday, 4 May 2014; One Year, One Month and Five Days Old. Ayla had her first night sleeping under the stars last night and this morning was her first morning waking up at a campsite. We’ve gotten out of town with a couple of friends for the long weekend and it’s our first time camping with Baby Ayla. Although we made a few rookie mistakes (like arriving after dark and forgetting to pack the tent but hey, lucky our friends have a big one! ), we started today afresh. After a big bacon and egg cook up the boys went fishing for the day leaving us girls to enjoy a swim in the nearby waterhole, have an afternoon snooze and get into the camping groove. 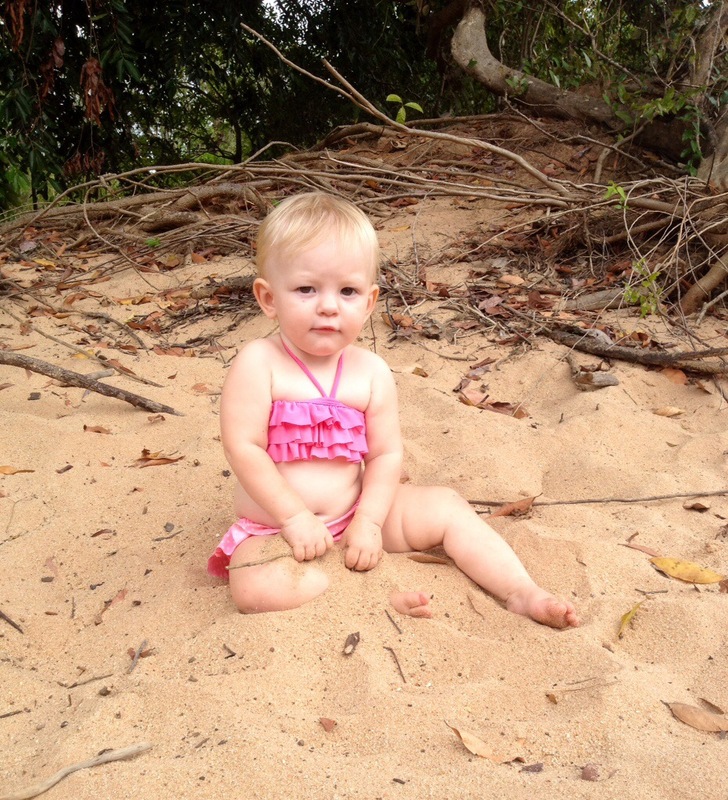 Ayla loved playing in the sand by the freshwater creek and floating around in the water; she loved it so much in fact that she didn’t even complain when her tiny fingernails started going blue with cold! After lunch and a rest Ayla spent the afternoon playing with toys on a big mat at the campsite, alongside our friends three year old daughter while we older girls chatted and pottered around. When the boys returned (without fish) we all headed up to the campground pool where Ayla spent ages laughing and playing with the rock feature waterfall while we adults played a very cruisy version of catch. By the time bedtime rolled around Ayla was exhausted; she had played and explored and learned til her little eyes were nearly falling out of her head and she fell asleep quickly and easily in my arms. With Ayla tucked up in the tent at the foot of our swag, I was free to really relax and thankfully there’s not many better places to do that than around the campfire with a beer next to great company after an awesome day.